What could the maker in your life do with a supportive community and the right tools? Tools include: 3d printers, laser cutters, a full woodshop (band saw, miter saw, drill press, lathe, CNC and more), kitchen, sewing and embroaidery machines, work benches, hand tools, electronics bench and soldering station, vacuum former, HERMS brewing machine, silkscreens, printing presses and more! A gift certificate suitable for gifiing will be malied to the address indicated at checkout. * Members must be over 18 and meet expectations outlined in membership guide. 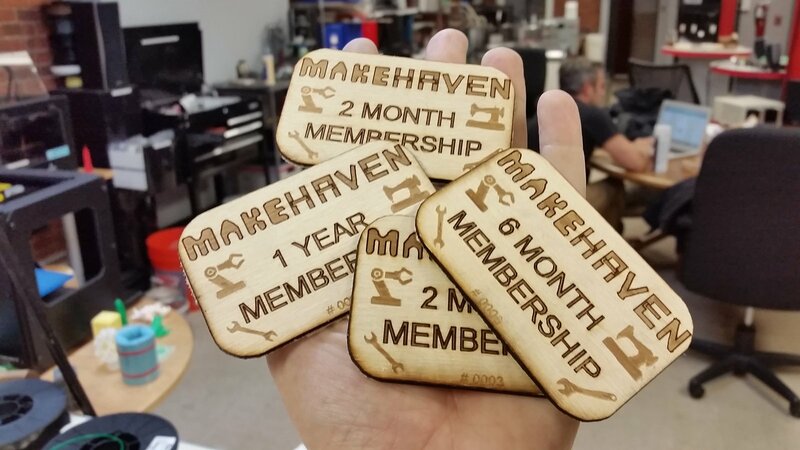 MakeHaven reserves the right to refuse membership and issue a refund. Membership term starts when when the new member signs up online. Must start within one year of date of purchase. Individual receiving gift card will signup through the standard membership process and a credit will be applied to their account. Individuals who qualify for student or other regular discounts will be able to apply discount with credit. For example a student membership can use the $150 credit at the student rate of $35 per month to enjoy a 4 month membership. The remainder of $10 in be applied in month 5 if individual chooses to stay on as a member. Credit on giftcards may not be refunded, nor may cash be exchanged or credits transferred. Cards can be ordered any time. To receive a mailed giftcard by December 25th, order by December 19th.